“I wanna get in the pool now, “ exclaimed Stacy suddenly. “Y’all can go, but I want to stay here on the lounges.” Maria said firmly, then shook her black shiny hair out of her face. Claire and Stacy stretched, having been about a hour on the lounges. They got onto the diving board, hopped off and performed graceful dives. It was not long until Maria popped up, startled by her phone. She quickly grabbed it. “Hey, guys! It’s a text from a camp manager! They want us to take on another case!” Maria exclaimed excitedly. “Amazing! Honestly, I was getting bored without anything to do.” Stacy exclaimed. “Wow! It takes place in Tasmania! That’s an island south of the mainland of Australia,” Maria said, almost shouting as her eyes darted across the screen of her phone. “We have a flight that leaves tomorrow at 9:00!” Maria shouted this time, making the other two girls cover their ears. “We have to pack,” Claire stated calmly, breaking the moment’s silence. Stacy and Claire got out of the pool and dried off and prepared to leave with the already waiting Maria. 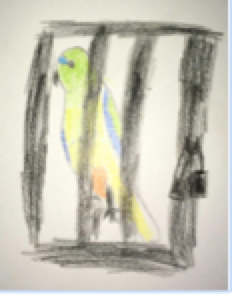 “Guys, the case is about endangered Orange-Bellied Parrots disappearing. They know there is fewer than one hundred fifty in the wild, but they see less and less everyday now. That’s why they want somebody to investigate, but not the police.” Maria stated, her eyes once again darting across the screen. She turned her phone around so they could see information and a picture of the parrots. “I wonder why they don’t want to involve the police,” Claire wondered aloud, turning to Stacy. The girls packed and got a good night’s sleep. Finally, they left for the airport. The three girls got held up in security and nearly missed their flight. “Phew, that was a close one,” Claire sighed with relief, rummaging around in her bag. “ Hey!” Claire exclaimed loudly, then cupped a hand over her mouth as people turned around and stared. “Look at this note,” Claire muttered to her friends, showing the note she had pulled out from her purse. You and your little gang must go before somebody gets hurt. Consider this your first and last warning! The two girls handed back the note, horror-struck, but had managed to not gasp; people were still throwing glances at them. The girls whispered about the strange, but serious note the rest of the trip. “Who could have gotten that into your purse? How did they know? How did they….” Stacy’s questions seemed never-ending. Maria and Claire spoke in low, fast voices as they tried to answer one question before she asked the next. Time seemed to fly once they got there until the truck ride to a little camp where the rare parrots were disappearing. “This ride ...is too…. bumpy” the three girls said together between the jerky movements of the truck acting as a taxi. They all got terrible headaches from it. “Next time I think I will walk back.” Claire said once they were out of earshot of the driver who had not spoken to them. Next they had a friendly greeting from the camp manager. “Thank you girls for coming. I was afraid you wouldn’t. Oh, what am I saying? Let’s get to the point. Welcome to Camp Wacapok! How about we hike on the trails first or get some relaxation before investigating? “ the red-headed lady said with a warm smile. “Also, we could find a clue,” Stacy said, getting more excited with every thought of the mystery. “Ya,” agreed Maria in her normal soothing tone. “Wonderful!” the lady exclaimed. “Oh, and you can call me Mrs. Copperhead.” she added. Again she spoke when the girls exchanged puzzled looks with each other. “We have nicknames from the campers,” she explained quickly. “I was a little too strict at the beginning, but I’ve changed. The name stuck and now I’m used to everyone calling me that,” she finished. “Oh…… that makes a lot more sense,” Maria spoke up. The girls started to follow Mrs. Copperhead and turned onto a neat gravel road. The girls looked around the gravel pathway and at the scenery around them, mouthing words of awe like ‘wow’ and ‘amazing’ every now and then. Birds chirped and the sounds of nature sounded from around them. Being used to the city, just about everything was bringing fascination to them. They entered a cabin, after they got to the end of the little street. “Mark! Marcie!” Mrs. Copperhead yelled out into the cabin. A young woman and a man came hurrying forward a moment later. The three girls were introduced to the woman and the man. After that they started out on the hike. “So, what’s it like here at the camp, Marcie?” Maria asked the girl. “Really good. It’s full of fun and excitement. Well, now it’s bitter and full of worry.” As she said the last sentences the cheerfulness in her voice drained quickly. Claire and Stacy continued to look around and point out things. Suddenly, a buzzing alarm call cut through the air. “That sounded like an Orange-Bellied Parrot!” Mrs. Copperhead exclaimed. A deadly silence followed after her words. They all strained their ears for the slightest noise. Finally, as they were about to give up, a deep, muffled voice could be heard through some thick bushes. They managed to hear some of what they were saying. “This is what I saw,” she stated later. “There were two cages, each one containing a bird,” she said thoughtfully. She paused to think, then spoke. “I knew you girls liked to play detective, but I never thought you would stumble across a clue this fast!” Mrs Copperhead exclaimed. They talked happily until they headed back. “Really?” Claire and Stacy cried. Suddenly, a net appeared and swooped in a graceful loop, capturing the bird in the process. They chased the culprit around, following the sound of thrashing bushes and snapping twigs. They soon gave up, however, when they could no longer hear the person running away. “Well, it is getting dark anyway,” Marcie sighed. “I guess you’re right, Marcie,” the others agreed. They headed back on the winding trail of broken twigs and misshapen bushes they had thrashed through to try to get the bird-napper. Finally, they reached the trail they had started off on. They took quick showers then hit the hay. 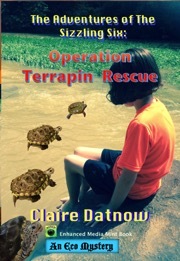 That day they hiked two trails and swam for three hours, but found no clues, which disappointed the girls, but none as much as Claire. This went on for four more days, making them more frustrated every day. Finally, on their second to last day, they got sweet success. They overheard something in forest surrounding the camp. “Those pest-like detectives nearly caught me; we ought to be more careful.” a voice said. “Yes, boss.” came the reply. “Let’s get them on the count of three,” Stacy said quietly. “1, 2, 3!” They dashed into the woods and caught up to two dark figures. “OW!” Maria cried, falling to the ground. The two girls ran to help her, but Maria shook her head. “Go” she mouthed. Stacy and Claire set off again for the criminals. “To the helicopter!” commanded one figure. “...........gaining on us!” cried the other. The girls beat them to the helicopter and pinned the men. “No more stealing birds!” they shouted. Then, Mrs. Copperhead and other people rushed from the woods and police sirens rang out. They soon learned that one of the counselors had been part of the scam. “Bobby! How could you?! You are a disgrace to our camp!” Mrs. Copperhead shouted. Bobby’s real name was Oscar Wheeler. The other person in the scam was a middle-aged man nicknamed Boomer aka Henry Black, who had been their truck driver. The police had come because Marcie had called the police when she heard Maria’s shouts sounding from the forest. It turned out that the men were selling the birds one by one to zoos and wildlife centers. Oscar and Boomer had lied about the birds’ background story; they had told them they were owners of a zoo that was struggling financially, forcing them to sell some of their most prized birds. The criminals were forced in the car, despite their struggle. “Yay! Another mystery solved!” Claire called gleefully into the wilderness. 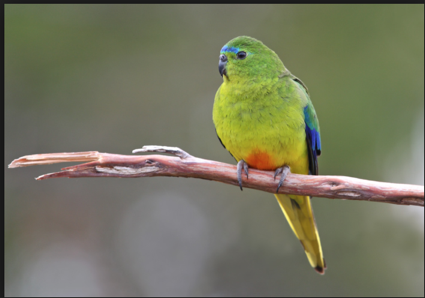 Note: On the brink of extinction, the orange-bellied parrot has been ranked as one of the world's rarest and most endangered species.